Often considered one of the best female golfers in the history of Canadian golf, Cathy Sherk’s playing record speaks for itself. 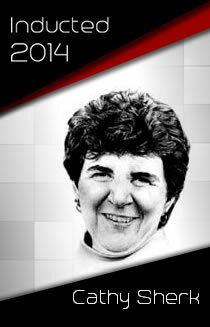 She won two Women’s Canadian Amateur titles (1977-1978); the 1978 U.S. Women’s Amateur; medalist honours at the 1978 World Amateur; and the 1988, 1990 and 1991 PGA Women’s Championship of Canada. Sherk was inducted into the Canadian Golf Hall of Fame in 1995.